We’re going to publish our 52-week travel plan (subject to change of course) – one post per week, or something close to that. Not only will that give us a good outline of our experience, but our hope is that if you know of anything, a place, a town, a restaurant, a park, a site, a show that we seem to be heading toward or nearby – PLEASE leave us comment on that post so we can check it out when we’re there. Our first week of travel seems a little busy/rushed since we’re only staying one night in several places along our way to Joshua Tree National Park. Mostly that’s because we want to try to only drive 3-4 hours or 200-250 miles per day, a perk we’re afforded via the luxury of having a whole year to see the country. At any rate – here’s week 1! 28-Feb Morro Bay CA 1 Visit with Amy Christie? Robin Mitchell? 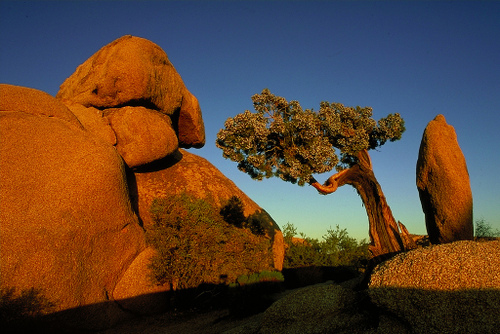 4-Mar Joshua Tree CA Hiking, Rock Climbing, Sunsets, Yum! (I can’t remember where we went for sunset – different place, but it was a long, curvy dirt road–it was awesome, but probably not what you’d want). Awesome, thanks ladies. We’ve added this to the growing list of things to check out. We’ll report back. I too took rock climbing lessons in Joshua Tree and did some hiking. Looooooved it. We camped and I’ve never seen the sky so thickly saturated with stars. Stretched out at night on a huge, flat rock still warm from the sun, it was easy to star gaze and pick out satellites moving among them. An open air shower at the end of the day near some boulders using a solar shower i had brought along was pretty epic too. Magical place. Enjoy.